Soup is one of my favorite things to make in my Instant Pot. I love that everything cooks in the same pot and is ready in minutes. 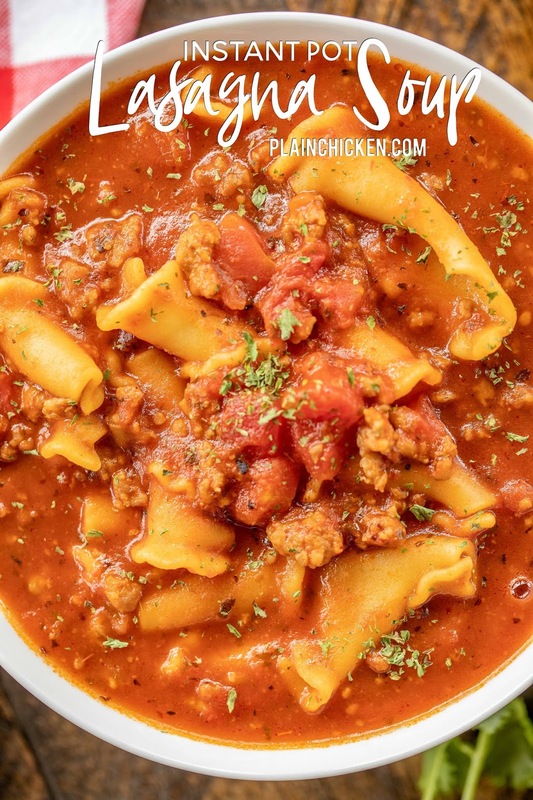 This Instant Pot Lasagna Soup is one of my FAVORITE soups! OMG! It tastes just like my homemade lasagna. 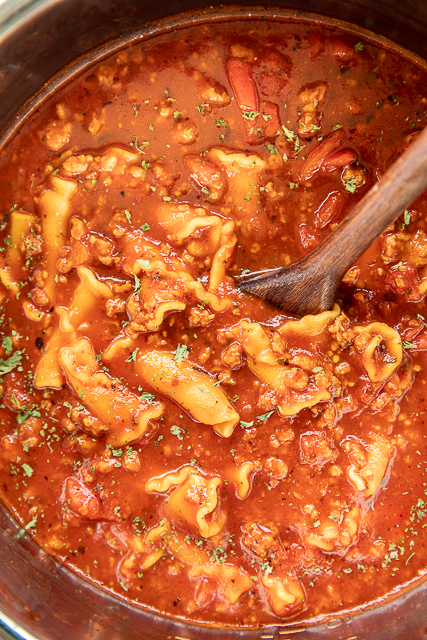 I happen to LOVE lasagna, so, needless to say, I LOVE this soup. I love this soup so much that it is on the menu again this weekend. YUM! I used Italian sausage in this soup. 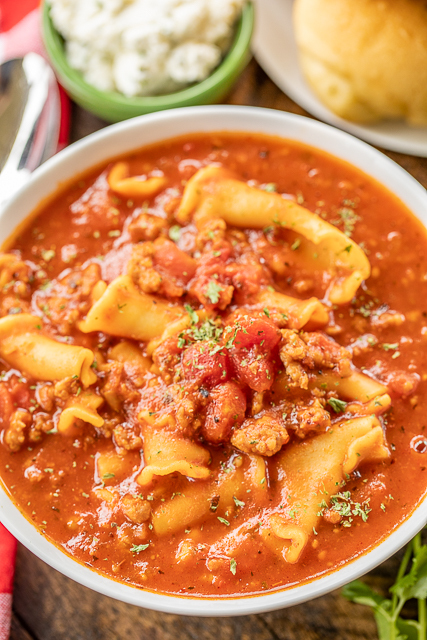 If you don't like Italian sausage, you can substitute ground beef or ground turkey. 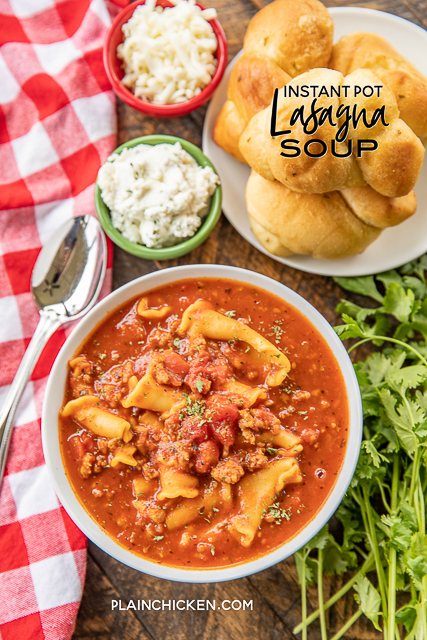 You will just want to add a little extra Italian seasoning to the soup. My jarred spaghetti sauce of choice is always Trader Joe's Roasted Garlic Marinara. It has a green label. If you don't have a Trader Joe's near by, I also like Rao's and La Damiglia Del Grosso sauces. You can find those at the grocery store. 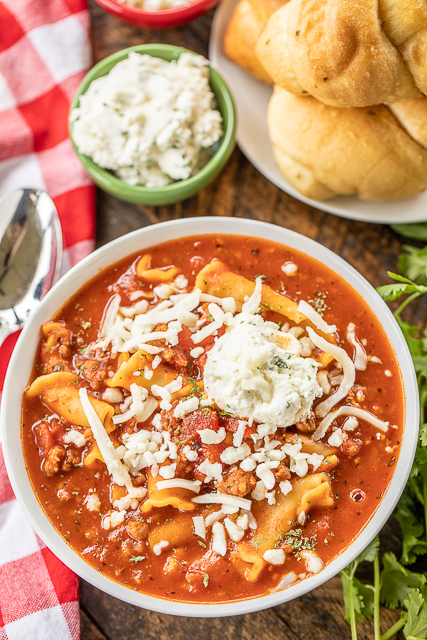 We like to top this Instant Pot Lasagna Soup with some mozzarella and ricotta cheese. We also like to have some garlic bread with the soup. PERFECT for dunking in the soup. YUM! Turn Instant Pot on Sauté. Cook Italian sausage until no longer pink. Drain fat. Add a small amount of the beef broth and scrape bottom of Instant Pot insert to avoid getting a BURN notice. Add remaining ingredients. Stir to combine. Make sure pasta is covered. Lock Instant Pot lid in place and seal. Cook on manual or high pressure for 6 minutes. Quick release pressure and serve. I so wish you would do a cookbook! i love ricotta!!!! that dollop on the top is perfect! Don't have an Ipot but bet I could do this on the stove. Any recommendations to make that work?